Designed for easily loading and unloading material, the Celero Conveyor System Belt provides operators a fast advance control of material and serves as a vacuum cutting surface ideal for flexible media, rigid substrates, and roll media up to 64”. MultiCam’s Automatic Knife Changer allows for up to six (6) knife cartridges changes in a single cut program. By fully automating the cutting process, the possibility for operator error is greatly reduced which in turn increases productivity and throughput. 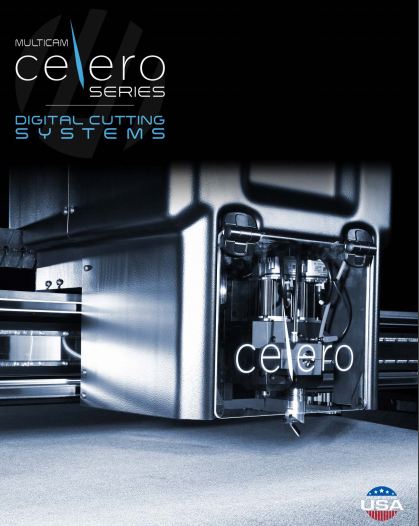 With cutting speeds up to 4,000 Inches Per Minute (IPM) and a rapid traverse speed of up to 7,000 IPM, the Celero 5 Series delivers high-speed performance along with tight motion control which result in an accurate and smooth cut quality. The Celero 5 Series is designed for routing rigid materials at high-speeds as it comes standard with an air cooled, 4 HP, 24,000 RPM spindle or an optional water cooled 5.5 HP, 50,000 RPM spindle. Each spindle is capable of handling tools up to 3/8” (10mm) in diameter. Digital Servo Drives and Brushless AC Servo Motors are integrated into the Celero 5 Series providing both velocity and torque with uncompromised accuracy for cutting applications. With a smooth motion and fast rapid traverse, end-users yield superior routing and knife cutting for a wide range of applications.